Discussion in 'Electric Vehicles' started by ChargePoint, Feb 25, 2018. Every week, we're sharing a roundup of EV news, on our blog. Whether it’s new models or new places to charge, we want to keep you current with what’s going on in the world of EVs, at ChargePoint and beyond. Here's a quick summary for those here in the community, and you'll find the full roundup at the links below. Chinese consumers are twice as trusting of self-driving cars as Germans or Americans, reports The Drive. The Chevy Bolt EV is the top “compact green car” according to Consumer Reports. More trips won’t need more oil: “Higher oil demand will be more than offset by increased engine efficiency standards as well as the larger number of EVs and shared traveling,” according to a new BP report covered in Reuters. You can find the full roundup here. We'll update this thread with future roundups, and feel free to join in with other industry news you find. [REPORT] Inside EVs reports that ChargePoint stations deliver juice to EVs more than 1 million times per month. Former CEO of the Formula One Group, says Formula 1 should go electric after 2021 regulations. UPS partners with Workhorse to build electric delivery vans for the company’s fleet. ... and more, over on our weekly EV recap blog! The Tesla Semi’s first test run transported batteries to Elon’s Gigafactory, and Electrek shows prototypes of a drone/EV hybrid that can handle air or ground transport. Take a look at the next-generation Formula E electric racecar, which goes 0–60 in 2.7 seconds, with a battery that can last an entire race. We celebrated 10 years (!!) 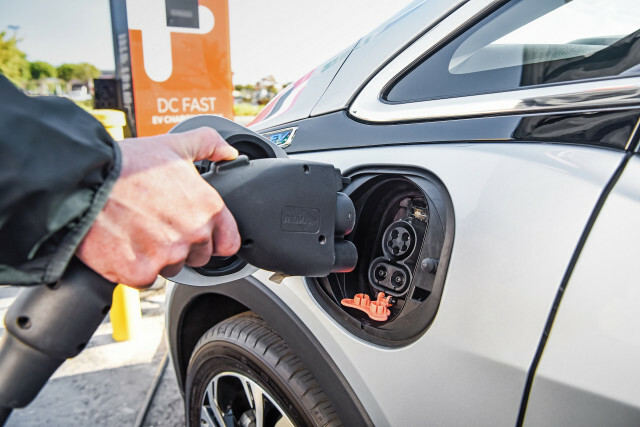 of clean transportation work with the California Energy Commission, and our director of utility solutions shares tips on EV program design at PowerForward. All this and more, in the weekly roundup of EV news! Will new Tesla Model 3 owners get more noise than they bargained for with their new EV? One driver tells Green Car Reports, “I have found the car twice in the garage, locked, with the stereo blasting at full volume for who knows how long,” as the publication covers other issues. The Drive determines how Brexit can impact electric vehicles in the UK. Jalopnik rounds up vehicle tax breaks, including a 30% tax credit for installing home charging. As always, find more details on the news above (and the remainder of the weekly roundup), at the link! See what cars qualify for the full EV tax credit via InsideEVs, and read about support for extending the credit in Green Car Reports. Green Car Reports also provided five things to know about Ford’s future lineup (spoiler: trucks are here to stay). California will breeze past its goal of 1.5 million EVs by 2025, says a new report from Next10 (PDF at the link). Is Aston Martin going electric under the Lagonda brand? We're introducing 20% off ChargePoint Home, the most advanced home electric vehicle charger available. It's compatible with Tesla, Toyota Prius Prime, Chevy Bolt EV, Chevy Volt, Nissan LEAF, Honda Clarity and every other EV on the road. Receive 20% off through April 22nd 2018. Read the full weekly EV news roundup, right here. Here's a summary of what happened in the world of EVs during the week, and hit the link to read the full weekly EV news roundup! ZDNet shows how today’s EV batteries could power tomorrow’s cities. 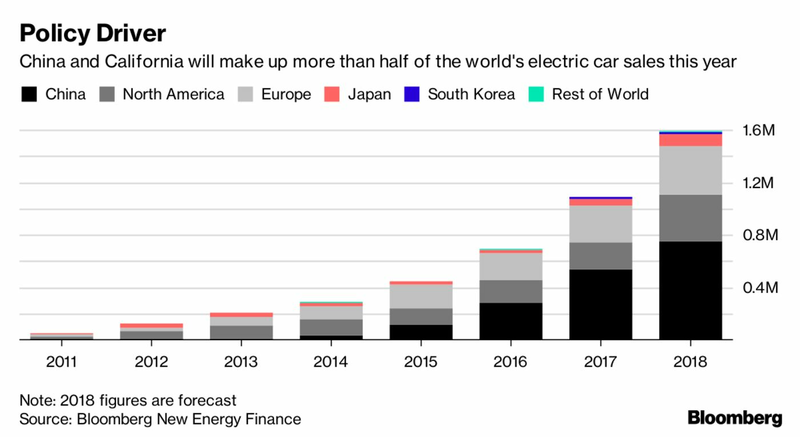 China and California are expected to make up half of worldwide EV sales in 2018, via Bloomberg. Colorado prepares to invest over $10 million in alternative fueling stations, including EV charging, as covered in the Denver Business Journal. The state is aiming for 1 million EVS by 2030. Autoblog has the scoop on Waymo's new self-driving Jaguar I-PACE, and we’ve got the scoop on how to charge it. See how the New York Auto Show reveals who's committed to electrification, on TheStreet. Don't forget, the full wrap up includes links to all the articles below and more info - it's at this link! Our very own Teslarati outlines how Tesla has quadrupled Model 3 output and committed to 5,000 a week in Q2. New Jersey Governor Phil Murphy signs ZEV memorandum, bringing the number of ZEV states to 9. NIO opens a service center next to Tesla. Meet Polestar, a new EV brand that’s part of Geely, alongside Volvo. THE EV SALES REPORT IS OUT! 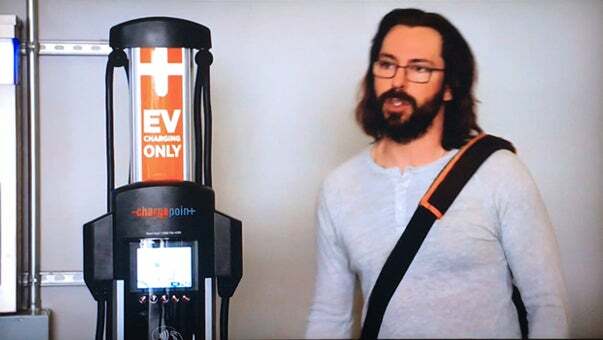 A ChargePoint sighting on TV! Being included in the show means not only that EVs have gone mainstream enough to be included as a major plot point in a popular TV show, but tt was also rewarding to see a real-world (okay, TV-world) use case for a feature we developed in direct response to customer needs—and our own needs, too (our Waitlist feature). It’s also exciting to see our work on the big screen sometimes and know that our product has “made it” in a different way. Our appearance on the show was not a paid product placement. Links to all the articles below and more info - at this link! Building on record EV sales in March, and Model 3s represented nearly half of all Tesla sales this year so far. The LA Times explores the impact of rolling back fuel economy standards. Is Bloomberg right that your future home could be powered by car batteries? Treehugger wonders if more data could encourage less driving. Green Car Reports drivers think EV growth will be faster than we think. Plus more news on EV's from Buick, Porsche & Kia. Teslarati explains how changing foreign ownership restrictions will allow Tesla to move ahead with a factory in China. U.S. News debunks reasons why people don’t buy electric cars. Does flooring it actually kill your range? CleanTechnica has the answer. Will classic cars become EV conversions as electrification expands? Norway commits to all-electric short-haul flights by 2040. ChargePoint and Santa Clara Valley Transit Authority (VTA) unveil new electric buses and charging stations. For a limited time, add Apple Pay to your ChargePoint account and get $5 in charging credit. Details here. San Francisco streets and sidewalks are filling up with controversial electric scooters, according to Wired. Nikola Motors sues Tesla for violating electric semi truck patents, as reported in USA Today. The Washington Post covers why 18 states are suing the EPA over plans to lower emission standards. U.S. Department of Energy’s $19 million investment in fast charging. Green Car Reports discusses the news that Subaru falsified emission numbers. This past Earth Day, ChargePointers participated in several events around the country—and the world—that reflect our commitment to electric mobility and show just how many different audiences care about this topic. We attended a Health and Human Services event in Washington, D.C., joined forces with the Port Authority of New York, spoke alongside Google Germany GmbH and Fluence Energy at the U.S. Embassy in Berlin (pictured below) and celebrated Earth Day with EV drivers in Palo Alto. California will require solar panels on new homes [New York Times]. Tesla plans to eliminate controversial cobalt from batteries, in Charged EVs. Charged EVs celebrates NYC’s commitment to take its bus fleet all-electric by 2040. How slime (yes, slime!) could advance self-driving EVs. We revealed a new concept design for high-powered charging of electric semi-trucks and aircraft. Watch our CEO, Pasquale Romano, unveil it at the Uber Elevate Summit. Flying cars? We're charging them! Here's more on the new 2-MW charger for electric aircraft and semi-trucks that we unveiled. Since 2017, ChargePoint has been the charging partner for Uber’s Elevate initiative, as the two companies explore innovations to help support the launch of a fleet of electric VTOL aircraft within five years. Leveraging Express Plus, ChargePoint’s ultra-fast charge platform, the company continues to develop designs specifically for use at skyports where VTOL aircraft will park and fuel as part of their day-to-day activities. Read more about the new two megawatt connector here in our press release, and on Electrek. First-ever wireless bus charging system delivers 200 kW to a BYD bus, as described in FutureCar. The U.S. Department of Energy reveals that EVs saved 216 million gallons of gas in 2017, up 39% from 2016. Convenience Store News encourages store owners to add EV charging. Visualizations of the higher fuel, maintenance and emissions associated with gas cars, as well as the declining battery costs and increasing range for EVs. Utilities and automakers have joined to pressure the Trump administration to uphold fuel efficiency standards. A round-up of city policies that can support EVs. 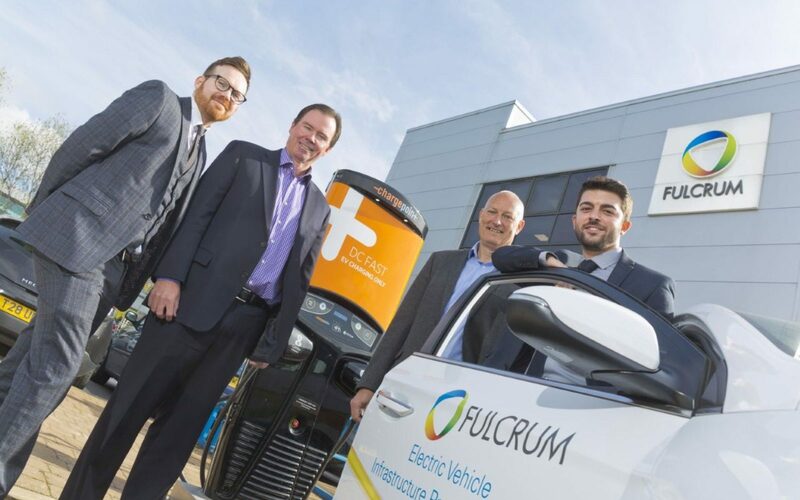 ChargePoint partners with Fulcrum to bring EV charging to the UK, as covered in Clean Energy News. Here's a summary of what happened in the world of EVs during the week, Read the full weekly EV news roundup at the link! Teslarati covers how a Tesla Model 3 went over 606 miles on a single charge in pursuit of setting a Guinness World Record. Forbes shares how $500 million in Series B funding could help Byton get its EV into production next year. Switzerland hosted the world’s largest EV rally. Engadget compares the Tesla Model S and Jaguar I-PACE. The days are longer, but your charge can be shorter! Save 20% on ChargePoint Home through July 23, 2018 — and see if you could save even more with a rebate in your state, right here at this link! Here's a summary of what happened in the world of EVs during the week, Read the full weekly EV news roundup at this link! Green Car Reports covers what Tesla Model 3 buyers are trading in for the affordable long-range EV. The New York Times covers both a proposal to freeze fuel economy standards and the fact that political officials have had clear evidence of climate change for several decades. Science Focus confirms that EVs generate fewer emissions than gas cars, no matter where your power comes from. The Sacramento Bee quotes our CEO, Pasquale Romano, in covering the proposed fuel economy changes: “California is the global leader in the mobility revolution, due in no small part to the state’s commitment to emissions reductions. It simply makes no sense to revoke this waiver at a time when California leads the nation’s efforts to compete in the global marketplace."